• Keep a printout of the pass to enter to the tournament hall. Entry will not be allowed without the pass. • The Civil ID which is mentioned in the pass will be verified at the venue. • Minimum Age to enroll for the tournament is 5 years. • Tournament will start at 09:00 Hrs. • Participants shall reach the venue at least 30 minutes in advance. 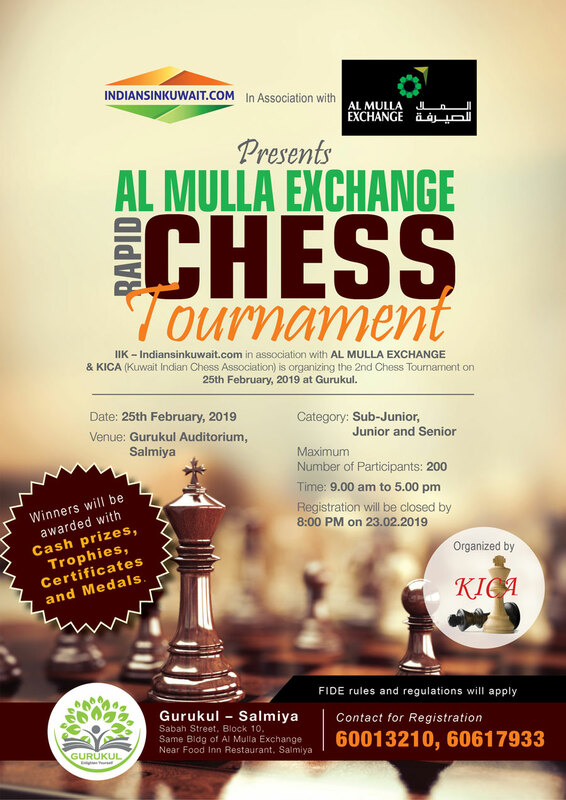 • FIDE Rules and Regulations will be applied. • The tournament will be Rapid and SWISS System will be followed. • Number of Rounds will be 6 (subject to the number of participants the number of rounds may vary) . • Registration will be closed by 08:00 PM on 23.02.2019. • Spot entry is not allowed (First match Fixture will be ready by 24.02.2019). Candidate age will be calculated based on the date (25-02-2019) of the tournament.